The Italian island of Sardinia is located in the Mediterranean, off the western coast of Italy, and a short distance south of the French island of Corsica. 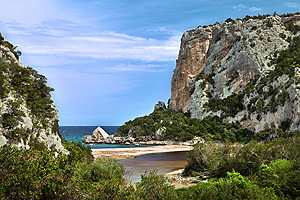 A very popular summer destination with both Italians and other travellers, Sardinia has a wide range of places and scenic highlights to explore, from the sophistication of the Costa Smerelda to the rugged mountains of the interior, and a large number of popular beaches and resorts. Because of its location in the middle of the Mediterranean, plus its 1129 miles of coastline, Sardinia is one of the most sought-after destinations for seaside holidays. As well as its beauty, beaches, history and ideal Mediterranean climate that make it such a popular island the welcome that you will receive from the islanders ensures a holiday that won’t soon be forgotten. With its turquoise waters and beautiful sandy beaches, the average temperature is between on the coastal regions is close to 30 degrees centigrade in the summer months, while inland on the plateau it can get much warmer. 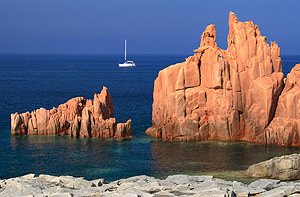 The 'winter' season is extremely short and Sardinia is a popular destination all year round. There are many things to draw visitors to Sardinia in addition to the seaside resorts and beaches, such as the towns and villages that offer a sense of the history of the region, so be sure to allow time away from the beach when you visit! The variety of the history that you can see is a consequence of the many different powers that have controlled the island over the last 5000 years. 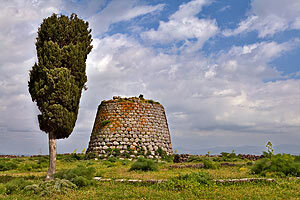 Almost unique to Sardinia, scattered across the Sardinian landscape you can also see more than 7000 'nuraghi', cone-shaped stone huts and fortresses, along with unusual temples and whole villages that date to the Bronze Age. Cagliari: at the southern gulf of Sardinia and the island’s main harbour, Cagliari has been the capital of Sardinia since Roman times and is one of the main entry points to the island with ferry services to Cagliari from Sicily and Naples. The Bastione San Remy provides a great access to the older city as well as a lovely view of the harbor. The view also includes a number of Pisan towers that used to be part of the city’s defensive structure, a Spanish Castle, and the 13th century Cathedral on Piazza Palazzo. See Cagliari. Alghero: once used as a fortress for the Spanish Viceroy, you can still see many examples of 16th century architecture here and the seven towers that were used for defense that dominate this walled city. Outside the old town, most of the activity is in and around the port where you will find row upon row of fishing boats with plenty of bars and places to eat along the way. Quick trips outside the town lead to the beaches at Porto Conte and to the impressive Palmavera Nurag ruins. See Alghero. Nuoro: many feel that for a taste of the true Sardinia you should head into the mountains to visit the town of Nuoro. The region is very remote and the people here still speak the original language of Sardo and have hung on to many of their old traditions, including craft making. This entire region is considered to be a cultural center where artists, authors, and poets like to gather. The landscape here is wild and beautiful, and Nouru is surround by three different mountain ranges. See Nuoro. Costa Smeralda: The “Emerald Coast” is the preferred spot on the island for the rich and famous of the world to come to play. Its beaches are hard to beat and there are many beautiful coves as well. Sardinia bases much of their food on the seafood that is so abundant locally, from the spicy fish soup called Burrida to lobster, crab, anchovies, squid and clams that are extremely popular in the local dishes. Don’t pass up the famous pasta dishes that include the Sardinian’s own versions of gnocchi and ravioli served with pungent cheeses. These dishes are wonderful served with one of the local wines. There are two villages on Sardinia that are classified as being among the 'most beautiful villages in Italy: Bosa and Castelsardo. There are also several towns and villages that have received the Italian 'Orange Flag Award' for sustainable tourism: Aggius, Galtellì, Gavoi, Laconi, Oliena and Sardara.